Don't have a reservation but are looking for a sit-down restaurant, then The Fountain Eats and Sweets, located at Walt Disney World Dolphin Resort is the place for you. 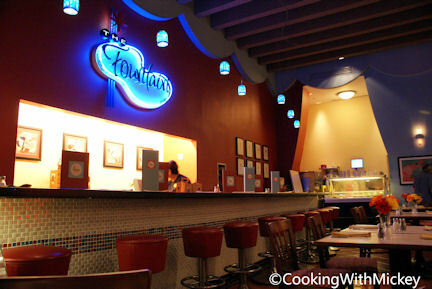 Reminiscent of a 1920's soda fountain shop with a modern twist. With a tiled counter, red bar stools, booths and tables you'll be taken back to a simpler time. Being located off the beaten path you'll find this restaurant to be quiet and relaxing. 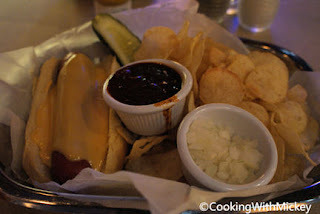 The menu includes diner favorites; soups, salads, starters such as onion rings and golden fries, and fountain classics like hot dogs and burgers. Both the burgers and hot dogs are build your favorite so you have a choice of several toppings to make it your own. 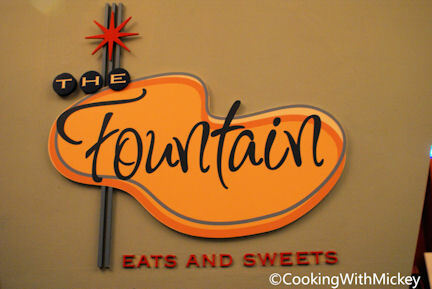 On my most recent visit I was looking for an inexpensive restaurant that I had never tried, and The Fountain was the perfect solution. One of my favorite comfort foods is tomato soup with grilled cheese. There are two soups that I always order in search of the best - lobster bisque and tomato. 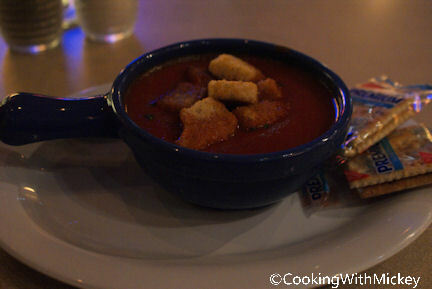 Therefore I just had to try their roasted tomato with herb croutons. This is not your canned tomato soup you grew up with, being roasted it's a grown up version of this classic. I had the hardest time trying to decide between a burger and hot dog. Being alone I had to choose. Normally I'd get one and my husband would get the other but that was not a option, so after much debate I went with the hot. Since I love the combination of cheese, chili and onions (all things that make Cinninnati chili great) I add those to my dog. It was a good size hot dog and combined with the chip, looking back I wish I can upgraded to the fries was just the right amount of food. I left full but not stuffed. Unfortunately I didn't have room to try one of their milkshakes. A good reason to go back! My server was very attentive, courteous and friendly. Bringing me refills on my ice tea without ever asking and continuous checking on me to see if I needed anything. This is a great place to stop and grab a bite of classic comfort food favorites. The wonderful service, delicious food and laid back atmosphere it's a fantastic place to escape the busy park, especially Epcot and Disney's Hollywood Studios, and relax in a quiet restaurant. The Fountain is on my list of places to try. Thanks for the review! I really want to try that soup.